Motorola’s second generation Moto G has a ton to offer with its new 5 inch display, smooth operating system, and killer price tag. Despite being ten months old, the LG Google Nexus 5 also offers a similar stock android experience, strong specs, and a low price tag. 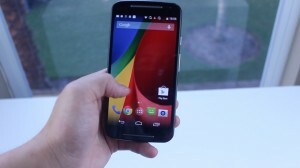 How does the the new 2014 Moto G stack up to the Nexus 5? Let’s find out. Physically, not much has changed on this new Moto G. It features the same removable plastic shell backing that we found on the previous moto g, but it’s not bad. It’s very ergonomically and fits snuggly in the hand. When it comes to the Nexus 5, the build quality, in my opinion, is better than the Moto G’s. Instead of plastic, LG opted to go with a matte rubbery finish non removable backing that’s similar to the feel of the Asus Nexus 7. The sizing of the 5 is very similar to the G, but it is slightly smaller. At the time of this review of the Nexus 5 can be purchased in 16 and 32GB variants with color options of black, white, and red available. It costs $350 unlocked and you can purchase one model that is compatible on Sprint, ATT, and TMobile. The Moto G on the other hand can be bought in black or white variants but you can also purchase different colored back plates to customize your device. It comes with 8 or 16GBs of internal storage, but unlike the Nexus 5, it can actually be expanded via micro sd card slot and has a removable back. If you’re planning on picking up the G though, you’ll need a micro SD card, 16GBs just simply won’t be enough. Generally when I go to purchase any sd card I go with SanDisk simply because they’re a recognized brand name, and I haven’t had any issues with them, so if you’re looking to pick one up, you can buy one here. Another great feature the Moto G has is dual sim capabilities, so this could easily double up as a work and personal phone if you needed it to. Along with that the G is said to be water repellant according to Motorola, and if you want to see a video on that let me know by giving this video a thumbs up. The speakers on the Nexus 5 perform pretty terribly. The single speaker on the Nexus 5 can be found on the left side of the micro USB port which is an ideal location to be covered up. And to add on to that it isn’t like the single speaker sounds great even when fully exposed. The Second Generation Moto G speakers are actually pretty impressive. They’re dual stereo front facing speakers that are quite loud, they aren’t as clear as the HTC One (M8)’s but they’re good nonetheless. The Nexus 5’s 4.95 inch display is pretty darn good. The full 1080p resolution comes in at 445 pixels per inch. Colors are vibrant, crisp, and just seem extremely accurate. It’s been over ten months since the release of the Nexus 5 and it’s display is still one of the best. The Moto G (2014)’s 5.0 inch display on the other hand is okay, it’s no where near one of the best displays I’ve used but it’s definitely not the worst. Viewing angles arent that great and doesn’t perform that well in sunlight. That being said, the screen is more than sufficient for use indoors and when in good lighting. 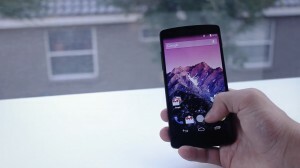 The Nexus 5 runs the latest version of Android, 4.4.4 KitKat. What’s fantastic about Nexus branded phones is that they will always be the first to be updated to the newest Android versions while other devices like the Galaxy Note 4will receive the update several weeks or months later. One of the main things I’ve enjoyed is the integration with Google Now. Its just a simple swipe to the left for all the information youve been looking for like weather finances news and more. The user experience is probably the best of any device I’ve used but the only downside is that it doesn’t have the same amount of features as something like the Galaxy S5. The Second Gen Moto G utilizes a lightly skinned version of Android 4.4.4 that’s extremely quick and smooth . Unless you’ve spent an excessive amount of time using stock android you probably won’t even notice the difference between stock android and Moro’s skin. Motorola has also promised an OTA as soon as Android L comes out, so if you do end up picking up this new Moto G, you’ll have that to look forward to. The G is really fast, I’ve experienced very little lag in the last week or so I’ve been using the phone which is really impressive considering the low price point. The Moto G rocks a moderately sized 2,070 mAh battery. This thing will last through a ten hour day with a couple hours of on screen time. You need to keep in mind the G only has a 720p display and lacks support for LTE so it doesn’t have as much to power. The Nexus 5’s battery is slightly better than the Moto G’s it will get me through a full fourteen hour day with tons of google maps navigation and constant gps refreshing, so the Nexus 5 has the edge in battery life. The final thing we’re going to cover is the camera performance. The Moto G has an 8 megapixel camera. It will produce somewhat bland dark photos that don’t really pop. The camera is one area Motorola obviously cut corners on to get to the $179 price tag. The Nexus 5 also lacks in camera performance. Like the G pictures just aren’t sharp or saturated enough. I guess they’re good enough for snapping a quick pic to put on Instagram, but you wont want to be using it for anything more that. The New Second Generation Moto G offers a new larger updated display, solid front facing speakers, and an incredibly low prics. The Nexus 5 has a wonderful stock android operating system, beautiful 1080p display, and a great user experience all at as price point under $350. For me, it’s a tough call, but which phone is best for you? Well that choice has to be made for yourself. Anyway, be sure to give this video a thumbs up if you enjoyed it, subscribe for more content like this, and I’ll see you all next time.